An agama is any one of the various small, long-tailed, insect-eating lizards of the genus Agama. 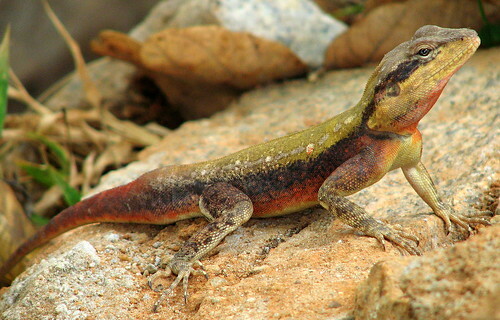 Agamas originally lived in forest and bush across Africa, but have since adapted to live in villages and compounds where their habitat has been cleared. They live inside the thatch of huts and other small spaces, emerging only to feed. 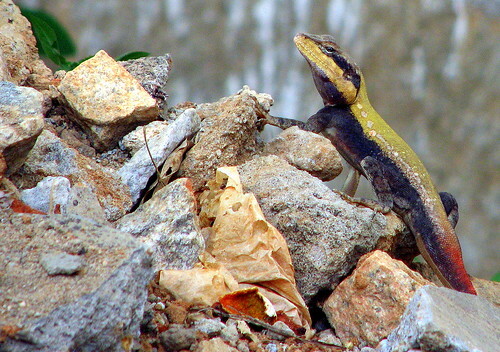 If caught out in the open, agamas are able to run quickly on their hind legs to reach shelter. 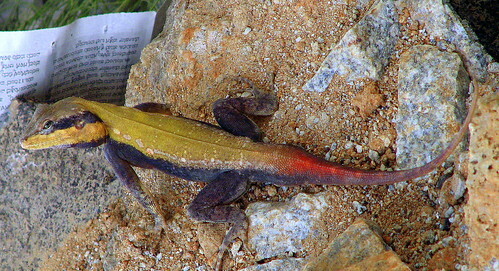 Most agamas are polygamous. Males may hold six or more females in their territory for breeding. During courtship, the male bobs his head to impress the female. Occasionally, females initiate courtship by offering their hindquarters to the male and then running until he is able to catch up. The breeding season is typically March-May with eggs being laid in June-September during the season after the rains. Eggs are laid in clutches of up to twelve. The most interesting fact is many people keep these as pets as well (am sure not in India). Basking occurs mainly in the morning between ten and noon (a good time for photography I shot it at 1:30), agama is a sit and wait predator. The agama that I spotted was about two compounds away from my house in South Bangalore, I spotted the bright and flashy male and also the almost black, white and brown female. I ran back home to get the camera and I shot a few pictures of the male but before I could get a few shots of the female, she disappeared. 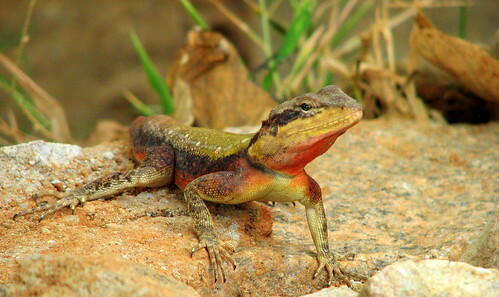 The informal names are Peninsular Rock Agama and South Indian Rock Agama, the real name is Psammophilus dorsalis. I have also heard that the Blanford's Rock Agama Psammophilus blanfordanus is found in India (Bihar, Orissa, Central Provinces, Eastern Ghats, Travancore south to Trivandrum) - Hope I can get a good glimpse of the female as well. Also this is my first journal entry. Thanks to Kalyan Varma for helping me to identify this species.